This new in-development site provides - as of 04/08/2015 - rendering of named zones (debris fields, nebulas) and objects (planets, bases, wrecks, etc.) and their infocards when requested, all in crisp, zoomable non-raster graphics, automagically generated in your browser directly from up-to-date game files each time you load the page. Note: This will be maintained alongside my old navmap site(s) and the Wiki system page maps, for those of you who use them. This is intended as a complementary and hopefully better alternative to those maps, as they require heaps of manual work (i.e. screenshots) to update and aren't really all that good nor usable - and particularly not so on mobile devices - for all the effort that they take to update. Do also keep in mind that it requires a relatively recent browser to display correctly, so Internet Explorer 8 and below is probably out, unfortunately. The current issue list is available on GitHub; this list is no longer actively maintained. Current primary tasks are highlighted in bold. - Certain systems and objects have... quirks that the map generator isn't too happy about, such as some phantom tradelanes in the Reppu Bend. Those are actually there! Cool. Should go check them out, I suppose. - The search field is confused by systems with identical names, such as the two Omicron 92s. Fixing this should be relatively trivial. The universe map handles them just fine for those who want to take a look at them. - There's no Omicron Lost! Fix. Fixed. - LXP 48N occupies the same position on the map as Braunschweig. Moved next to Connecticut and Bastille. - Safari on OS X doesn't seem to be a huge fan of it; investigate. Fixed, required a few vendor prefixes. - The "Scroll Up" button doesn't have an uniform margin when the page is zoomed in; investigate. Probably related to the ".infocardContainer *" rules. Fixed on 11.12.2015, was related to an infocard parsing bug. - Possibly related to the previous issue: The map has once failed to render system connections. This fixed itself on a refresh, which makes it sound like a file isn't arriving when it should - which can and will happen - but check the universe map module to make sure that there isn't any larger underlying issue or cause that manifests itself only (very) occasionally. - Certain zones show up as being named "undefined" in the infocard viewer. - Premium Scrap shows up as "Premium Scap": This is a spelling issue in the Ioncross files distributed with Discovery. Fix: Implement commodity infocard lookup FL's own lookup .ini. - The Kansas <-> Unknown connection isn't registered by the shortest_ .ini generator despite there (apparently) being a JG leading back to Kansas in Unknown. Is this actually usable in-game? Investigate. - Exclusion zone rendering is still odd for some systems; figure out what's going on here, as there are obviously some details missing. The most obvious example of this is perhaps Omicron-100. - Map tooltips occasionally appear outside the viewport for very large zones, creating an unwanted scroll bar: These need to be constrained to the dimensions of the current viewport. - All map labels should be constrained to the dimensions of the current viewport, to prevent any of them from going off the boundaries of the map. - The minefield in New Hampshire does not render like it should; same goes for the debris field in the middle of the system. Investigate if there's an issue with zone type parsing here. - The highlighter has a slightly amusing bug where it'll offset the planet drop shadows, making them go outside their planets. Fix found and and committed, but not uploaded yet (11.04.2016). - Display all object's position on the z-axis to simplify finding off-plane objects. - Verify navmap generation accuracy and functionality for all systems. Seems be mostly pretty damn accurate after a month of testing. - Verify modern browser compatibility. Should work just fine in anything recent (and/or above IE8), though. Works in almost anything above IE8. Anything that supports transform: rotate() should be fine. - Check and improve usability for user agents missing the Agency FB font. Find OpenFont alternative. - Create small, stylized vector icons for all object types to distinguish between them. Circles aren't terribly user-friendly. - Fixed header for the menu. - More responsive and mobile-friendly layout/design; keep that in mind while redesigning the header and menu. There are, however, inherent limitations in attempting to make the information-dense maps like these mobile friendly; may need an entirely own version at some point down the line. Working alright with the current auto-scale implementation. - Investigate efficient label overlap handling - is it at all possible without causing unacceptable map generation delays? Hooray for NP-hard problems! Same goes for an algorithm for using z-index intelligently to prevent object/zone overlap. - Test GitHub hosting. Doesn't work. Works! - Clicking/hovering a system type on the map legend should highlight it on the universe map (and vice versa) for colourblind accessibility. - Find alright-looking way to increase label contrast (more) on hover. - Clean up settings menu; make default view and options closer to FL's navmap view (i.e. without star and zone labels). - Determine if object colouring is an issue or not; some stars/light sources don't have descriptions/names that match with their burn colours. Should the script attempt to determine colours from other things than just the burn colour? What do they actually look like in-game? Investigate. - Are there more ways to grab the actual in-game (non-navmap) colours of nebulas? Investigate. Unfortunately not, many of these are directly defined in the textures for each asteroid/zone type and not accessible without access to the textures. - Create overlap-detecting function for label placement and for adding different styles to things depending on whether or not they are inside zones. First part fixed 14.01, not sure what I meant by the last bit of that sentence. - Add search result highlighting, so that typing in a base name will open the appropriate system map and highlight the base in the system (somehow) instead of just opening the system map. - Update house/system display types to match the ones in this post. - Check and update all system classes; note down which changes have been done and why. - Add a display that shows object info on hover/click (for mobile users and copying/pasting) that allows the user to quickly get technical information about an object (z-position, docking, object owner, mineable commodity). Add close buttons to infocard menu and hover menu when added. - Actively reposition the infocard container as the user scrolls to avoid having to scroll left/right to find the infocard container. - Add on-hover tooltips to the universe map that show which type of system it is defined as in the rules. - Add direct system/base links and get the back button working now that it's out of an iframe. - Add a "link to this object" button that highlights the object on the map when the link is opened to the infobox container, and update the URI to that link while the infobox container is open. Add infobox container close button. Use the same highlighting mechanism in searches to highlight the base/object that was searched for. - Convert system connection coordinates/sizes to container-relative values instead of absolute pixel values to allow for dynamic resizing without having to re-generate the system connections. Can't actually think of a good way to do this yet, as relative sizes won't work inside a container. - Fix the highlighter for planets: It's occasionally off-center. - Add tooltips with object/zone names on hover if the label is hidden by an option. - Route plotter: Mode that lets you add waypoints, calculate the total route length inside a system, and share the resulting route. Should be relatively simple to implement using an overlay div that prevents unintended clicks while "route mode" is enabled (or something) that adds a waypoint object where the user clicks, adds them to an ordered array with waypoint coordinates and then plots lines between them using the Line object when the user is done. Add option to enable/disable lines. - Rework all internal nickname parsing away from using the Ioncross files; switch to parsing FL's own lookup .inis (didn't know these existed until recently). The outdated Ioncross files cause issues with relatively new commodities like commodity_flourine, and proper parsing will be required to display which items are on sale on each base. - Update the loading screen more frequently so that the user knows what the map script is loading. Would make for easier troubleshooting as well, in case it does decide to hang during the loading at some point. - Add styles for .object[data-archetype="track_ring"]. - Add a radiation damage indicator to zones. - Add an option for setting the map size manually. - Implement (restricted) label overlap prevention for the universe map. - Constrain label positions to the map container boundaries. - Prevent labels from disappearing under non-transparent objects, such as planets. - Display base information (ships/commodities for sale) - This is quite non-trivial to implement, as it requires parsing all the scene scripts for commodity/ship dealers. Maybe one day. - Object icons that better identify their type, like on the in-game navmap. - Option/help screen with map key and options for selecting which objects/zones to display. - Requested: Option to display ID ZoI maps. - Requested: Display base rumors. Work started, but non-trivial for the same reasons as for why displaying other kinds of base information is hard. - Wiki links for systems and objects (?) Perhaps, but work on generating and displaying as much information as possible from the game files first. - More FLC-like features. A rudimentary route planner and plotter would be nice. - Add input fields for changing the map's scale. It can work alright at both larger and smaller sizes depending on user preference, so it'd be worthwhile to have this as an option, and particularly so in combination with an auto-scale option! Could show/hide particular labels (such as on zones and wrecks) depending on the map scale setting to prevent clutter, essentially using the map scale option as a proxy for both map detail and size (like any good map should). - Clean up code (state transitions) and comment more of it. Create a proper state machine to simplify adding code to state transitions (map -> universe map, etc.) and to prevent unpredictable behaviour on state changes. - Skins? Some kind of gradient-free print/"chart" mode would be cool. - Display data/positions from TLAGSNET when using the DSAce.log connection option? - Display non-map data (infocards and such) and the map side-by-side on wide viewports to better utilize screen space. Wasting screen space on the left/right side is a no-no. Implementing an UI like this would also be convenient for having WebStat and the navmap side-by-side for glorious pretend-spaceship usage. Main criteria required for this is adding an option for scaling the map by viewport height, which should be trivial. - Adding mineable commodity sale places and prices to mineable fields (could work as a demo/starter for adding commodities elsewhere, and for adding more FLC-like functionality). - Displaying starspheres as the map or page background would be cool, if there's a simple way to export them in bulk. - The map labeling algorithm does not actually have to know where all the labels go in advance, or find the positions of all labels to check if they overlap! A simplified version could be made by creating an array with all the label positions (and their boundaries) as they are generated and pushing their positions a bit down if there's already another label that's within the boundaries of the label that's being added. The main issue is finding an efficient way to iterate over such an array to check for matches, of course, but it should be doable without that much calculation: There aren't that many labels to iterate over for each pass, but the issue with doing it after-the fact is that labels may be moved over other labels. Wait, no, that can be handled by it being a nice little recursive function that runs until it doesn't detect any overlap, I suppose. Trivial, really. Naw. 14.01. - Universe map size probably needs to be static: Does not resize well at all due to the need for system labels. [18.08] Autocompletion and all bases have been added to the search input box since last time, so if you're wondering which system a base is in you can type it in and it'll take you there in a second or so. [19.08] We're live! Report any bugs you may encounter here as usual; any further overnight patches and bugfixes will be uploaded tomorrow morning (approx. 0900 SMT 20.08) this evening (~1800 SMT) when I get home again. [21.08] Shows infocard numbers and plane-relative locations for all objects now. [21.08] And base/object owners. It's got some issues addressing them using correct English, though, as it's not quite sure where to add "the" yet. Probably best to just show the faction name somewhere else instead of trying to stuff it into a sentence. [22.08] System scale indicator added, to make it a bit easier to gauge distances in-system. Some progress has been done on adding rumors for each base, but this seems non-trivial to do without some server-side scripting to process it all due to the size of mbases.ini where they are defined. We'll see. [23.08] Added zone fog colours, so the maps should have a bit more colour (where applicable). [23.08] System ambient colours are now used to add a tint to the map's background. Just tell me if it's a bit much and I'll tone it down a bit more. [28.08] There have been a few more changes to the layout and design since 23.08 such as some transparency for the map background and removal of the grid on the universe map, seeing as it didn't really have much of a purpose or use there. [29.08] Module 1.1 is currently being uploaded; expect it to be live in an hour or so. [30.08] All live and good to go after two hours. [05.09] Added a little menu for toggling visibility of wrecks and zones with persistent settings; expect more options there soon. Navigation menu is now fixed to the top of the page for wide browser windows. [06.09] Changed system scale indicator to display sector size instead; added option to toggle back to previous behaviour. [06.09] Trade lane style changed to show their orientation better. [06.09] Experimental system connections added! [09.09] Resolved a new bug where disabling system connection rendering and reloading would cause the universe map generator to wait for them to render (forever). Not good. [09.09] Removed OORP/"deleted" systems from the default view (i.e. systems that you can't get into with a JH/JG). There's an option for enabling them again in the menu. [10.09] Trade lane rotation parsing and rendering fixed for all lane types. [10.09] Fixed infocard display scrolling issue (where it would scroll too far down when opening an infocard on low-res screens or high zoom levels). [10.09] Link to experimental infocard change suggestion form added to the infocard display. [11.09] JG connection styling added to the universe map. Do please tell me if it's a bit much and I'll look for another solution. [24.09] Added experimental nebula/field/zone styling. Do report if it messes up completely somewhere or if there are otherwise any other issues with it; the rock/asteroid texture will be replaced. Replaced solid zone border with a slight white shadow. [25.09] Further tweaks to zone textures. [26.09] Added a black shadow to JH connections to make them stand out a bit more in fields (and to show that the area around them is clear). [29.09] Temporarily added that box shadow to jump gates as well. Will try rendering the actual exclusion zones instead ASAP for accuracy. Reverted. Implement exclusion zones instead. [01.10] Fixed bug where stationary gas miners would show the hazard buoy infocard in addition to the (correct) gas miner infocard. [01.10] Fixed rather ugly spherical field positioning bug; rather surprised that nobody noticed this before (including me). [02.10] Zone overlap issue fixed! Working on the UI and adding mineable field overviews now. [04.10] Forced mining fields to render during the loading animation instead of after, to prevent them from suddenly showing up on the navmap whenever the script felt like it was done. Not very user-friendly, that. [05.10] All systems checked for rendering issues (none found), changed some system classes (particularly in Gallia) to match server rules and current mod version. [08.10] System connection styles tweaked to be a bit more clear. Still WIP. [11.10] Minor changes to the map loading screen. [11.10] Added a link to the mining guide to the mineable field info display. [11.10] Added a "screenshot mode" button that changes the map background colour to the forum background colour and removes the header. [12.10] Fixed minor issue where the page wouldn't scroll up while loading a new system on desktop browsers. [20.10] Updated for Module 1.3. [20.10] Updated system connections (FL Path Generator hadn't been used on the latest patch, apparently). [20.10] Added a transparent background to the map labels on hover to hopefully improve contrast and useability. [21.10] Fixed rather embarrassing issue where the script didn't check if a zone or object was commented out. [21.10] Adjusted label line height. [22.10] Omicron 90 changed to being listed as a Nomad World. Omicron 100 and Mu have been changed to being listed as Edge Worlds. [22.10] Uploading latest patch now, ETA probably six-seven hours (~4AM server time), as I need some sleep and the upload won't finish before an hour or two from now. [22.10] Upload complete. Yes, there's a phantom jumphole in Zeta that's called the "Omicron Rho Jumphole". Not sure whether it's actually there or not, but it's not usable nor clickable so that's at least working like it should. Will take a look at that tomorrow. [23.10] All uncommented code issues should be fixed now thanks to /(\n[^\r\n;]*\[[Oo]bject\])([^;\*(?=\n\w*))/g and /(\n[^\r\n;]*\[[Zz]one\])([^;\*(?=\n\w*))/g, which took quite a few more hours of missed sleep to create than I'd expected. About time that got worked out, though. [23.10] Map rendering quality (hopefully) drastically improved; Omicron Minor should now look approximately like it does in-game. The main difference is that rendering of unnamed zones (like exclusion zones) has been implemented, so you can actually see minefield paths and the racetrack in Dublin, which is nice. [24.10] One-way system connections now have a red dash at the middle. The map does not yet indicate which way the one-way connection is; I'll get that fixed as soon as I can. [24.10] Added DSAce.log input function: After connecting the map script to your DSAce.log file you can access the input field from the game by typing "/map yourinputhere" if you want to use the map while you're playing. No log files are uploaded from your PC when you use it: it's all accessed and processed locally using the HTML5/JS FileReader API. [24.10] Fixed exclusion zone type 2 rendering: These were twice their intended size for some reason. Should have guessed that that was the issue earlier. [25.10] Added arrowheads to one-way system connections, removed the not-too-pretty gradient. [10.11] Attempted to recover first post from cache, so some entries may be missing from the change log. Five or so pages of discussion were also lost, but I'm reasonably sure that little of the content has been lost; I used to note down things in the to-do/issue list or in other places as soon as it was posted/discussed. [23.11] Changed Okinawa to Border Worlds. [29.11] Removed dashed border from Gallic systems on the universe map. [29.11] Fixed issue where certain alien jumpgates (e.g., the ones in Pennsylvania and Omicron Minor) would be unclickable. [29.11] Infocard container now scales to fit inside small viewports, to avoid having to scroll left/right to read text on mobile devices. [30.11] Fixed issue with the asteroid file parser not ignoring uncommented code. [02.12] Off-plane objects now get a small tooltip when hovered that shows how far up/down they are. This information is also duplicated on the infocard display. [02.12] Limited the maximum accuracy of floating point numbers in the tooltip. [03.12] Wreck styling altered into small X icons to match FL's navmap. 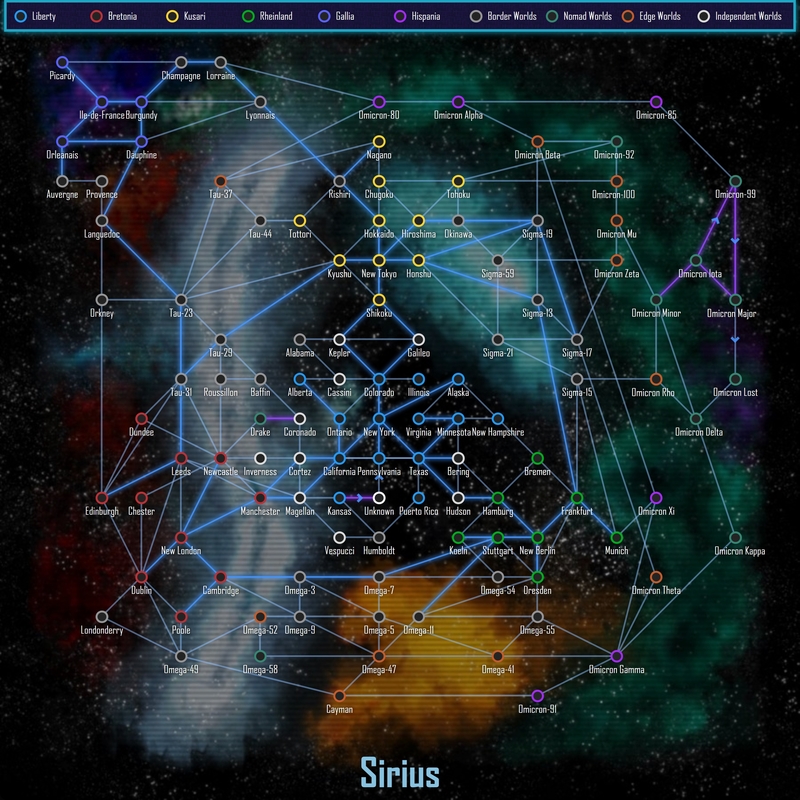 [03.12] Added a link to a 1500px screenshot of the Sirius overview map as rendered in Chrome 47.0.25. [07.12] Got tired of scrolling up manually; added a "Scroll up" button to the bottom of the info(card) containers. [07.12] Resized the "Scroll up" button. [07.12] Got tired of the old, pixelated and tiled background as well; reused the one from the Wiki and improved the contrast on the map itself a bit in the process. [07.12] Background was a bit too distracting, reduced the brightness and contrast of it. [08.12] Had forgotten to add background-size: cover; so the background image would tile like the old one (unintentionally). Fixed. [11.12] Resolved an old infocard parsing issue. [14.12] Added map links now that we're out of an iframe. [15.12] Fixed an OS X font antialiasing issue. [15.12] Found and resolved a race condition in the system connection generating module and control panel that was created by the recent addition of map links. Made the infocard container sticky for small viewport widths. This needs further work. Update will be issued a bit later tonight when I get home. [16.12] Update uploaded, infocard container improvements postponed until I can find a reliable polyfill for position: sticky in Chrome and various mobile browsers. [17.12] More work on dynamic/manual map scaling for different viewport sizes. [19.12] UTC+0 12:02: Latest mod update will be uploaded and live as soon as it's out and I'm home. [19.12] Further work on attempting to make the map responsive (i.e. rescale dynamically to your browser's viewport). [20.12] Still doing further work in improving code efficiency/modularity and adding more display options and responsivity to the page. A relatively large update for it (with patch notes and a small announcement) should be out over the next few days. The largest remaining issues is making the header responsive and figuring out when/how to show various types of content for different viewports (such as the Sirius map house legend). [20.12] After half a day of CSS wrangling later, the new patch and the updates for module 3 should be good for deployment tomorrow. [21.12] Update will be delayed a bit due to unforeseen issues with the method I used for making it scale with the viewport's size. Should be a relatively simple fix, fortunately. [21.12] Finished search object highlighting; added to the upcoming patch. [21.12] Finished base highlighting links; added to the upcoming patch. [21.12] Patch is now live. Will add the San Diego patch eventually, but it may be postponed a bit, as there are no other significant changes. [21.12] Added /map up, /map down and /map removehighlights. [03.01] Uploading module 4 now. Should take about an hour. [03.01] (23:10 UTC+0) My apologies for the delay, running into some issues with universe.ini with the latest mod update; working on getting it resolved as fast as possible. [03.01] (23:30 UTC+0) Module 4 is now live. Any hotfixes issued overnight will be added as soon as possible tomorrow. Thank you for your patience! [04.01] Removed alternate link. I will make it redirect to the main URL shortly due to speed and long-term maintainability concerns with the Google-hosted version at 471.no. [05.01] (00:41 UTC+0) Any incoming patches overnight will be live later today. [05.01] Added internal nicknames to the technical info readout, and reorganized it a bit so that the mining info always comes first under the Technical Info header. [06.01] (23:45 UTC+0) The latest patch will be uploaded ASAP, just working on rolling out a hotfix that resolves the map script occasionally putting the wrong extra infocards on objects first. [07.01] (01:26 UTC+0) Battleship Altenburg is no longer a gas giant. Implemented infocardmap.ini parsing, in other words. Was wondering how/where those infocards were defined; thanks for the heads-up, ! [07.01] (01:52 UTC+0) Packaging latest update for upload now. [07.01] (02:40 UTC+0) Update scheduled for tomorrow morning (i.e. in eight hours or so). My apologies for the delay, just got to get some sleep. [07.01] (14:40 UTC+0) Uploading patch now. [07.01] (15:12 UTC+0) Latest patch now live. [07.01] Fixed race condition where universe map would (very, very) occasionally render without house classes. Restyled unusable jump gates/holes to make them stand out a bit better. Stopped trying to generate object names for objects without infocards; this was a relic from early development, and caused the generation of a weird name for the jump gate debris in Bering. Hopefully permanently fixed all uncommented code issues if there were any left. Also fixed an issue where the map link wouldn't update after searching for a system. [07.01] Omicron-93 is no longer listed as an OORP/inaccessible system. [08.01] Added a temporary fix for one of the tradelane exclusion zones in Kyushu: it was rendering at an odd angle. Root cause will be investigated tomorrow; I think I've got the solution already. [08.01] Reduced grid line width by 50%, may adjust them up a bit again. 0.2em seems to be bit too dominating to me; feedback would be much appreciated. [08.01] Fixed a bug where multiple lootable field definitions in one asteroid .ini could throw the mineable zone module off. Added planet textures! [10.01] Nomad JG connections are now purple. [13.01] Deployed (hot)fix for zone rotation bug: Map now adjusts sign of zone rotation to account for x-rotations of +-180 for all zone types. This was the root cause of the Kyushu lane exclusion zone rendering bug, which I've now removed the temporary fix for. [14.01] Simple label overlap prevention algorithm added! It preserves the horizontal placement of labels and pushes them downwards if it detects any overlap between two (or more) labels. [14.01] Fixed a minor issue where enabling the label overlap toggle wouldn't actually take effect before a new system was loaded. [16.01] Reorganized config menu into sections, added options for toggling map labels, added a favicon. [17.01] Moved the screenshot mode button into a position where it can't appear on top of the map if it is scrolled down. [17.01] Omicron-93 listed as an inaccessible/OORP system again. [18.01] Working on the waypoint thingy. [21.01] Still working on implementing the waypoint module and manual map scaling. [30.01] Added an issue with New Hampshire zones to my issue list. [03.02] Currently working on adding an option for scaling by viewport height instead of width, and looking into other ways to improve the user interface; suggestions would be much appreciated if you have any. [04.02] Code finally moved into a GitHub repo for versioning and documentation purposes; the repo may be found here for those who may be interested in taking a look. Also spent some time cleaning up and dusting off some of my old code from last summer in the process. [05.02] Made a whole lot of my code more robust (which should prevent surprises if the server software changes overnight) and added an option for scaling by height instead of width. Also fixed some issues and in general improved the old width scaling styles. [08.02] Added a small inset gradient to planets to make them look a little less like textured discs. [09.02] Testing a version of the same effect on zones and stars. [09.02] Made zones a tiny bit brighter/less transparent to compensate and to make it look a bit more like the in-game navmap. [10.02] Currently working on performance tests and fixes; I'm considering removing position: fixed from the background, as while it's cool to have a bit of extra depth it is not worth huge amounts of scroll jank while the browser repaints everything. [10.02] Nope, figured out a much better solution! Scroll performance should be massively improved on the current version. [10.02] Fixed screenshotMode bug introduced by the last commit. [11.02] (09:45 UTC+0) Uploaded the overnight patch (v4.88.4 Patch 3). [04.03] Removed possibility of accidentally selecting text when trying to click a map label. [05.03] Uploaded a few fixes (such BHG Guard -> The Core) and implemented some caching improvements on the live version after a period of testing. [14.03] Resolved issue in Munich (and a few other systems) where certain tooltips would appear far outside the map and make the scroll bar(s) jump around. [26.04] Uploaded a few of the bugfixes that I've been working on over at GitHub, added an option to show all objects. [26.04] All objects with hidden labels now have tooltips with their labels when hovered over. Objects without name infocards show their internal nicknames instead. Added styles to differentiate between objects with and without infocards. 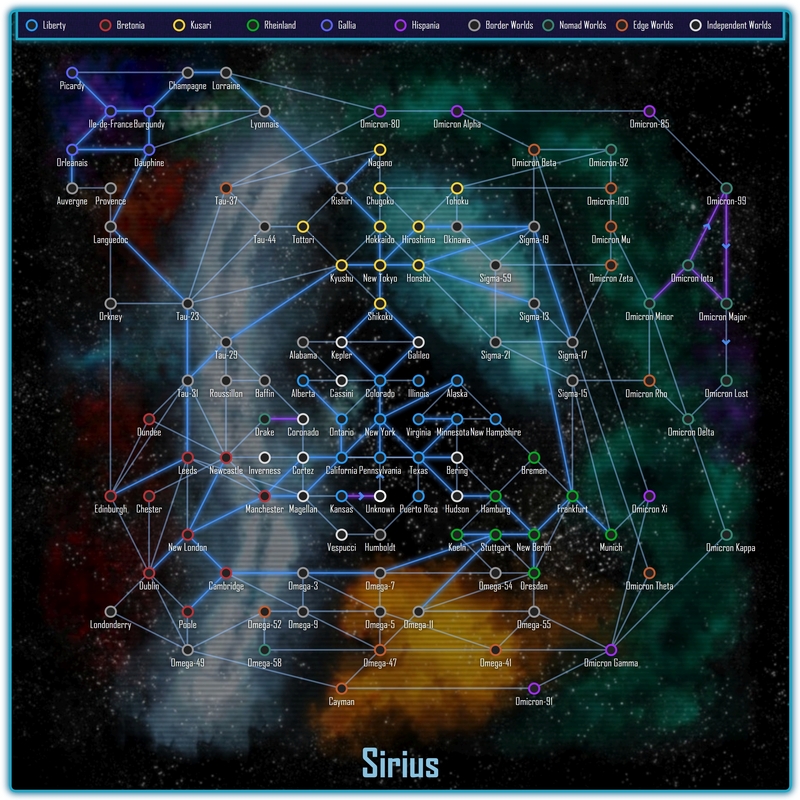 [04.05] Uploaded a new high-res screenshot of the Sirius map. [10.05] Done a bit more work; it's now getting accurate orientation from the ship's direction of travel. Will upload it to the live version as soon as it looks and works like it should. [12.05] (09:55 UTC+0) Uploading latest patch now - took quite a few hours longer than expected due unexpected changes/updates/bugfixes required for the new mod version. Throwing in the "/pos in" command into this map patch as well, documentation for it will follow shortly. [12.05] (10:19 UTC+0) Patch is now live. The "/pos in <system>" command has been enabled for in-game usage, and a draft for the documentation for it may be found here until I've got a forum-friendly finished version ready. I've also added a small icon to dockable planets to differentiate them from "regular" planets after a few (very understandable) user requests. [12.05] (11:35 UTC+0) Uploaded missing player ship texture, "/pos in" should work as expected now. [12.05] Added some temporary hacks to get the map to go to the "correct" duplicate bases. [12.05] Added a small delay to searches containing "Freeport 1" to make it a bit easier to search for Freeport 14/15/11/10. [13.05] (05:17 UTC+0) Latest patch will be uploaded as soon as I can today. [13.05] (06:14 UTC+0) Uploading now, should be live in about an hour. [13.05] (07:37 UTC+0) Latest patch is now live on the map. [14.05] Updated a few system classes for v4.88.5. [15.05] (10:17 UTC+0) Working on v4.88.5 hotfix 2 now. [15.05] (11:33 UTC+0) Uploading, ETA ~20 min. [15.05] (11:48 UTC+0) Hotfix 2 is now live. [15.05] (11:54 UTC+0) Iota -> 99 nomad jump gate issue fixed. [15.05] Uploaded the latest infocard patch. [25.05] Improved DSAce.log input styling and feedback a bit. [31.05] Updated the high-res map screenshot. [29.06] (00:02 UTC+0) Working on updating the map for v4.88.6 now. [29.06] (02:02 UTC+0) We're good to go. Happy exploring! [29.06] Uploaded missing planet textures; thanks, Xalrok! If you've got any unlisted suggestions, bugs or just a question or two, feel free to come with them! I greatly appreciate all the feedback that I can get, as I probably won't be able to pick up all bugs during testing due the enormous amount of different objects and zones this has to handle. That's pretty damn cool, nice work! Wow, I'm saving the link because that is some good clean web design right there. Short and to the point too. The pages load so fast that I don't even need to plot a course in game, I just look at your map and follow the lines. Thank you very much for ever ounce of work you put into this. This kina stuff makes me happy I'm back. This is awesome, nice work! It's pretty good, I've been looking into accomplishing similar using svg or canvas. Would probably be easier for drawing connections and whatnot.